The Barbados Wildlife Reserve occupies four acres of mahogany forest near the top of Farley Hill, next to Grenade Hall Signal Station. It is known as the animal kingdom of Barbados where you can stroll freely among animals feeding and playing in their natural environment. Here you can see agouti, armadillo, Brocket deer, pelicans, iguanas, turtles, tortoises, parrots, flamingos, peacocks and of course, the Barbados Green Monkey. The monkeys are most abundant at afternoon feeding time. Only the more dangerous animals, such as pythons are kept enclosed. This is a popular attraction for the children. Top Tip: Arrive by 2pm to see the monkeys, especially the babies being fed! The Barbados Wildlife Reserve was established by Canadian primatologist Jean Baulu and his wife, Suzanne. 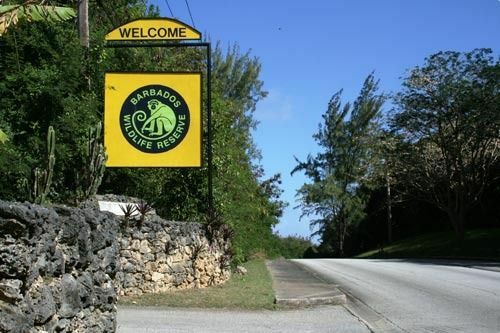 They first founded the Barbados Primate Research Centre on the site in 1982, for the conservation and study of green monkeys which were brought to Barbados in the 17th century and which are now widespread on the island. It was expanded into a wildlife reserve in 1985, with funding from the Canadian International Development Agency.